Proud Launch Of Paver Plant In LEBANON. 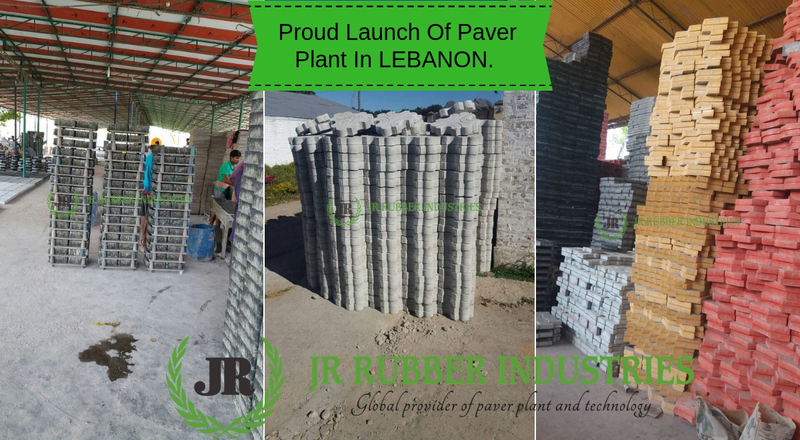 We, JR Rubber Industries proudly declare that we had successfully launched a paver production plant at the client site in Tripoli, Lebanon. Lebanon is one of the world’s smaller monarch state. In 1926 it became Republic and achieved Independence in 1943. Lebanon has different attributes that differentiate it from many of its Arab neighbours. It shares many of the cultural characteristics of the Arab world. Having a high rate of literacy Lebanon is one of the most populated countries in the Mediterranean area. Lebanon extend to avail as a busy mercantile and cultural centre for the Middle East. At Lebanon, our technicians from India is there for Machinery installation and production regularisation. We provide mini paver plant, semi paver plant, and fully paver plant for our clients in Lebanon. Apart from this clients produced Rubber Moulds and Mini paver Machinery and accessories for the wet cast tile production. We have immense gratitude to all our clients who made this happen. We globally established paver plant off different capabilities. We manufacture plastic moulds, rubber paver moulds, and PVC moulds and supply machinery and accessories, colour oxides and chemicals. You will be trained with our specialised team on production. We provide rubber moulds, PVC moulds, and plastic moulds all over Lebanon to our beloved clients with the help of mini pave plant, semi paver plant, and fully automatic paver plant. The below given paragraph will provide you with enough information about these in detail. Paver block making machine manufacturers mainly consider mini paver plant for paver production. It consists of a concrete mixer, a pan mixer, two vibro forming tables. The purpose of pan mixer is colour mixing and a hydraulic hopper is connected with the concrete mixer. It has a three phase motor attached with it also aN 8mm plate with 3000 drill holes. 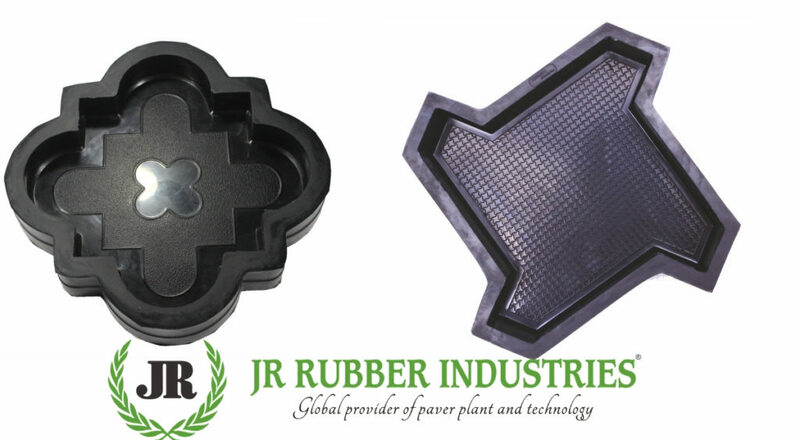 With the support of these machine we, JR Rubber Industries make a large number of paving blocks in different shapes, colours, and patterns. For paver rubber moulds India the tile making machine is involved with the automatic movement of the rubber mould. The speciality of this machine is that there is a paver mixer machine for the colour mixer and a hydraulic muller type grey mixer with the hydraulic hopper. An advanced technical assistance is also provided with this machines for efficient production. This paver plant possesses more production capacity than mini paver plant. This machine consists of two pan mixers, a conveyor belt, a concrete mixer, four Vibro forming tables, and a distribution box. Here pan mixers are considered for colouring purpose and also the concrete mixer is designed with a hydraulic hopper. This semi paver plant vibro forming concrete tile making machine is designed in 8mm plate with 300 drill holes. It is rooted with two 1.5 HP three phase motor with all observant extras and three vibro forming tables. The color mixer in Malaysia has the production capacity of 150kg per each batch. It uses a 3 HP electric motor for power supply and a 20ft nylon conveyor belt with all other necessary accessories. Rubber block manufacturers in Indonesia and many more countries use this technique for particular machinery features. Paver mould manufacturers widely use fully paver plant machine for their production. Due to its fully automatic nature, it reduces the manpower to a great extend favouring easy and enjoyable working atmosphere in the site. This automatic methodology will prevent the duplication of material handling and also helps in saving money. This will result in the production increase. The end result will be well structured fully finished product with the finest quality. Giving different shapes to plastic, rubber, metal, or glass using mould is known as moulding. The container in which the liquid raw material turns into solid when poured in it is termed as a mould. Rubber paver moulds are used to avoid quick wear and tear. 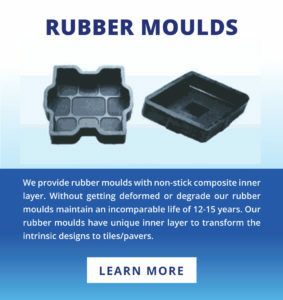 Without deformation and degradation, our rubber moulds have 12-15 years of lifespan. Creating usable rubber product from elastomers or untreated rubber is what a rubber moulding is. Rubbers have the property to retain back their original shape on applying pressure. An elastomer is a natural polymer possessing elastic properties to return back to its original state. Because of this reason, they are widely used in industries. Their malleable property makes them perfect in industries. Not only for malleability but also for many other multiple utilities they are widely used in domestic and industrial sectors. It is one of the kind of thermosetting plastic that can be soothed by heating. It is a long-term resistant to oxidation and degradation. Pvc mould manufacturers in India consider block Pvc and others for flooring, decorative sheets, artificial leather etc. Pvc moulds are extracted from 57% chlorine and 47% carbon with an excellent property of splintering, decaying, insect infestation, fire resistant. 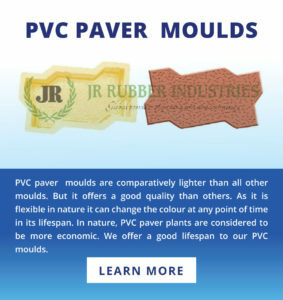 Pvc pavers are suitable for interior as well as exterior applications. Plastic moulds emerged in the 1800’s as a replacement for ivory billiard balls. The first plastic injection moulding machine was invented by Hyatt and his brother. They used a basic plunger to inject plastic into the mould through a heated cylinder. Polyethylene or polypropylene like powdered or liquid polymer is placed into a hollow mould to make the polymer to take its shape. Various ranges of heat and pressure are used to create an end product depending upon the type of process used. We offer the plastics made up of virgin plastics. 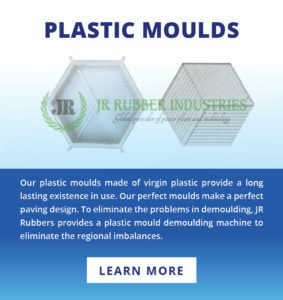 JR polypropylene plastic moulds maintain shape and very less prone to breakage. Plastic pavers mould machine available with us greatly reduce damage caused to plastic moulds during the demoulding process. 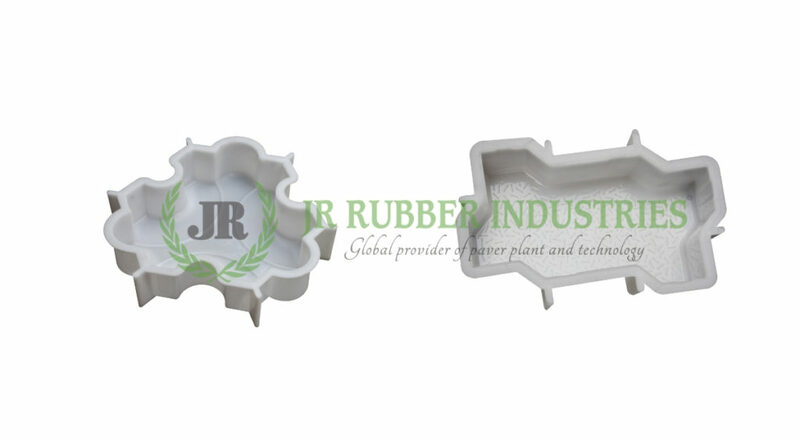 JR Rubbers are excellent and trustworthy suppliers of plastic moulds, pvc moulds, rubber moulds. They are enriched with various machines like semi paver plant, mini paver plant, and fully automatic paver plant. They are now eminent suppliers of these products in Lebanon too. Our products have reached almost all over the world. Lebanon is the 29th country we are stepping into. We had successfully completed our projects and spread the fame our company all over Lebanon. We are the leading solution for exterior flooring industry along with the manufacturing and supply of moulds, pavers, oxides etc with years of experience. Kerbstone, tiles, rubber Moulds for Pavers, cover blocks polypropylene plastic moulds pavers and many other customized products. We had shown our excellence in countries like Kenya, Tanzania, Uganda, Rwanda, Zambia, Somalia, Malawi, Niger, Nigeria, Bahrain, Riyadh, Oman, Jeddah and now extending to Lebanon and in Southeast Asia – Vietnam. We have all the answers for your paver product needs with 25 years experience. Whatever be your business pattern or whether it be your domestic needs, we are always here to assist you in the case if needed. 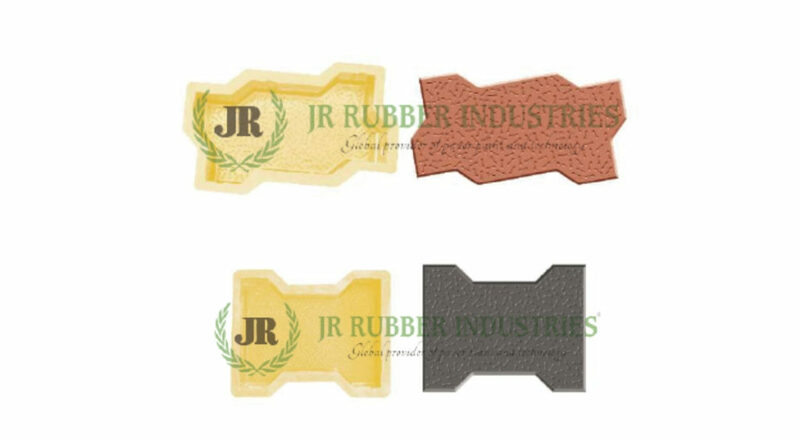 JR Rubber Industries are the leaders of this industry for 25 years with the motive of providing quality products. You need not wash the moulds in the lifetime, its appearance always remains the same. Assurance of lifespan of products for 12-15 years. Our products are made with 100% virgin raw materials. We provide innovative and creative designs for products. We offer the most reliable products and service to our customers. Posted on Categories Rubber Paver MouldsTags concrete paving stones, interlocking pavers machine manufacturers in india, kerbstone in rwanda, paver blocks in india, pvc brick mold, pvc mould for paver molds, pvc mould manufacturer, pvc moulding, rubber paver mouldsLeave a comment on Proud Launch Of Paver Plant In LEBANON.